A weekend away for the young adults of King's Church Edinburgh. We'll take a couple of coaches on a short trip north into Perthshire, to the grand old house of Lendrick Muir. We'll kick off with a bonfire, then we'll have two days of incredible teaching and worship together with lots of space and downtime to relax, process and get away from it all. There's free time where you can join a walk or bake or play football or take some time to yourself. We've invited Chris Taylor, an amazing church leader and speaker from The Hague in the Netherlands to come and speak to us for the weekend. If you've heard Chris before, you know he's an engaging, provoking teacher. You won't come away from one of his sermons unchallenged. Plus we'll have useful, practical seminars that will speak to you whether your week is spent at work slogging out that 9 to 5 (what a way to make a living) or whether you spend your days in lecture halls and labs. It's going to equip you to live out your working and studying life for God. Plus, the worship times will give you space to hear from God, to glorify Him and to deepen your relationship with Him. Outside of the meetings, you'll just have loads of fun. 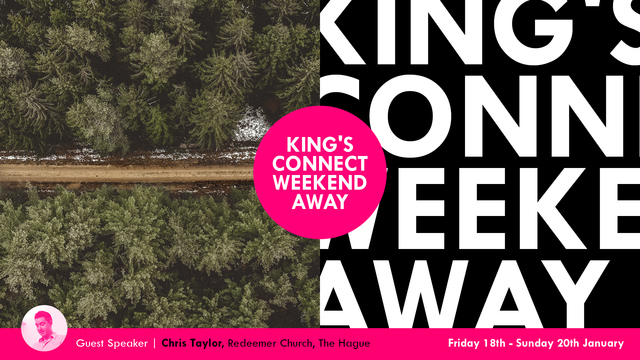 It's called the King's Connect Weekend because we want you to connect with God and to connect with your church family in Edinburgh. It's for the young adults at King's Church, which means our students, our twenties and early thirties. We've tweaked the weekend to make sure it's helpful for everyone across this demographic. If you're around that age and you're wanting more of God, this is for you.